Muhammad Ali turned 70 years old today. Getting there, especially in a body racked by bruises and scars seen and hidden, must have been a battle for the one we now all call "The Greatest." Muhammad Ali, though he choose a different sort of arena than the Rev. Martin Luther King Jr, fought racism, the U.S. government, and sometimes his own supporters and fans in defense of his convictions and conscience. As relevant for sports fans as political junkies, Ali also fought for what and who a World Champion was supposed to be. All these battles Muhammad Ali, who could alternatingly move slowly with caution or lightening fast with almost abandon but never did either without deliberation, won. Somewhere along the line, you could say, he fought History. He won that battle too - in 1972. Finally unleashed from his legal battles with the US government for refusing to serve in Vietnam, Muhammad Ali spent '72 fighting his way back to the heavyweight championship that had been taken away from him in 1967. Ali may have been a symbol to many but in those days his association with the Nation of Islam, black militancy and the antiwar movement had brought down more blows on him by the government than any fighter ever did. The virtually abandoned ex-champ even announced his retirement on February 3, 1970. Being Muhammad Ali, he didn't stay quiet for long or retired from boxing. The former Louisville Lip would cement his dominance of the sport throughout '72 with six straight victories in front of sell out crowds all over the world in an endurance battle with himself, the odds and history to regain his title. On January 17, 1972, just two days after Joe Frazier obliterated Terry Daniels in New Orleans in both a WBC and WBA title defended fight, Ali celebrated his 30th birthday with 1,5000 fans at the half-full Westchester Community Center for an exhibition bout with sparring partner Alonzo Johnson. The half tongue in cheek event was conceived as a favor to Pete Bennett, a promoter who had assisted Ali in getting speaking engagements at colleges and universities across America at $5,000 a pop when the boxer wasn't allowed to fight. Seemingly without a care, Ali let fans climb in the ring to take his picture, landed a few punches on Johnson, let Johnson, who he would appear in several exhibitions that years, land a few shots on him and dance around at bit. Called "flabby" by the New York Times and mocked for all the empty seats, Ali said, "for what I'm doing it is a good crowd." Characteristically self-confident and self-conscious, he added to the paper of record, "I'm not in training. I ate cake and pie today, I'll do my best and I still look good." Look good? He looked great and the fact that the former Cassius Clay was legally able to fight in the ring was nothing less that an epic poem in action - even for a natural born media circus like Ali. After three and a half cold and lonely years, where his longtime rival Frazier, who left us too early on November 7, 2011, actually helped financially support Ali and his family, the Champion-in-internal-exile was able to get his fighting license reinstated in Georgia. Several other states followed and on March 8, 1971, Ali and Frazier fought in Madison Square Garden in front of a SRO crowd of 20,455. Of the two unbeaten fighters, the bobbing and weaving Frazier won the fight on a unanimous decision, but even his thunderbolt left hook in the 15th round wasn't able to keep Ali down. 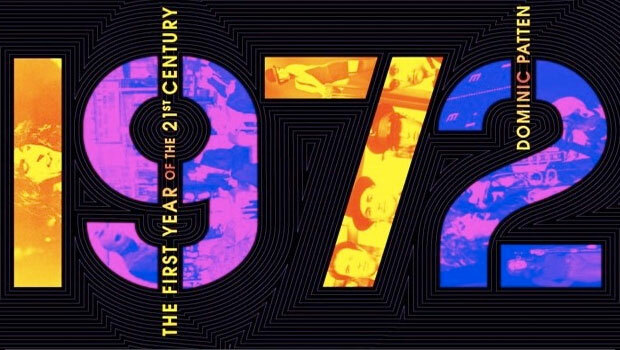 With the roar of the crowd and the ticket booth in the promoter's ears, the inevitable rematch of January 1974 was being planned before the athletes were even out of the ring. By the beginning of '72 and the birthday match, Ali was steeled to work his way back up to an epic championship. A couple more purse sweetened exhibitions followed in Vancouver on January 28th and in Pittsburgh on February 18th against Al Migliorato and then the serious boxing began. The first to feel Ali's determination to take back the belt was Mac Foster in Tokyo on April 1st at the Budokan. It was the first time a major prizefight had been held in Japan, or Asia for that matter, and to hype it up Ali declared that it would all end in "round five cause he's talkin' jive." However, with a 28-1 record, all the wins by TKO, Foster was a serious challenger, and one not easily disposed of. Foster, who as a sparring partner once flattened the mighty Sony Liston, was a fighter even Joe Frazier avoided. Ali's prediction about the fight with Foster was a bit off, to say the least. They were still at it by the end of the 5th. The fight actually took a full 15 rounds, but in the end, by unanimous decision, Ali, who was tipping the scales at a very heavy 225 lbs., was the winner. 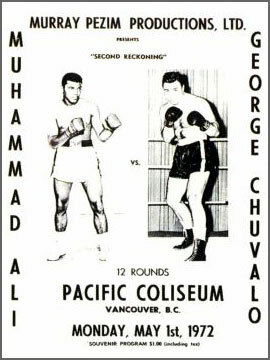 In quick succession, it was the formidable George Chuvalo in Vancouver, Canada where Ali defended his NABF heavyweight belt, on May 1st and won on decision in 12 rounds. Just 14 days later, Joe Frazier again successfully defended his title with a 5th round TKO against Ron Sander in Omaha, Nebraska. After a couple of more bouts and some more exhibitions, including a loss to Elmo Henderson on October 24, 1972 in San Antonio, Ali returned to the big ring and took on Floyd Patterson on September 20th at Madison Square Garden. The match brought rejuvenation to sport after the horror of the murderous terrorist attack on the Munich Olympics that saw killed. Even with the immediacy of that attack now long past, the Ali/Patterson battle still ranks as one of the most popular fights in boxing history. Don't believe me, follow the money. Years later, the fight inspired sneaker giant Adidas to put out a special limited edition shoe and apparel that they called "Confidence" in 2007 incorporating posters from the time as part of its Ali Collection. Both fighters wore black and white trunks that night, but their styles were very different. A great fighter and the youngest Heavyweight champ ever, Patterson was quick and sharp with a mighty left hook. Yet, because of his short reach often jolted forward at opponents to get a punch in and he had none of the footwork skills of Ali. By Round 6, Ali was still dancing and starting to really work on Patterson, landing blow after blow and causing some serious damage to one of his eyes. Bleeding heavily by the end of the 7th Round, Patterson, who was also suffering severe back pain, resisted his trainers plea that not he go back for more of Ali's punishment. The ref disagreed and found the lacerated eye serious enough that he stopped the fight before the next round really even started. The crowd booed, causing what one TV announcer to call them "ignorant" and that "one of the great fighters of our time shouldn't be humiliated any more." In the end, Ali was declared the winner by technical TKO. With a Frazier/Ali rematch now on every boxing fan's mind, the young editor of Black Sport magazine wondered if there was a racial element to the sides people were choosing, that if there were still a lot of bad feeling towards Ali because of his stance on the war in Vietnam and his allegiance to the Nation of Islam. "Is Joe Frazier a White Champion in a Black Skin?" asked the cover story by Bryant Gumbel on the October issue of Boxing Illustrated. The question of a great white hope of any form to stop Ali made a lot of people very uncomfortable. At least Gumbel, who that very month was starting his first television gig as the sports guy on L.A.'s KNBC, had the guts to ask it. Ali may have had his own thoughts on the subject but continued inching towards Frazier. After a few more exhibitions, he finished off Bob Foster in the 8th round, and the year at Nevada's Sahara-Tahoe Hotel on November 21st. Six days later, Joe Frazier was on The Tonight Show assuring Johnny that he would win again the next time he and the challenger met. While in Japan fighting Foster, Ali had poetically promised that when they finally got back in the ring he would hit Frazier so hard that the world "would watch the launching of the first colored satellite." It took almost two more years for Ali and Smokin' Joe to finally meet up on January 28, 1974. By then Ali's hard work had paid off, in ways he probably hadn't anticipated. First of all, it was a non-title fight because Frazier had lost the belt to a pummeling from George Foreman just over a year beforehand in Jamaica. Secondly, it was a less than dramatic victory for Ali after 12 rounds in a fairly average fight. The two would meet one last time, much more dramatically, in the "Thrilla in Manila" in October 1975. That was a true battle of champions, and almost destroyed both men. However, by then Ali, who had already been off to Zaire and reclaimed his title from the unbeatable Forman in the epic "Rumble in the Jungle," was in a whole different stratosphere. The whole world, including many in America on HBO, which debuted in 1972, watched as, in the intense African heat, Ali allowed Foreman to pummel him, leaning back on the ropes and offering only scant punches of his own. Finally in the 8th round, the method to his meaty madness was unveiled - Foreman, who had never gone this long in a fight and never under these conditions, had boxed himself out, and with a patient right, Ali brought the giant down, took all the titles, became once again the undisputed Heavyweight champion of the world and passed into international mythology. Hell, years later that fight still resonates. When We Were Kings, which follows both fighters in and out of the ring in Zaire, won the 1996 Academy Award for Best Documentary. In 2001, the Michael Mann directed Ali, which garnered star Will Smith an Oscar nomination, also depicted the once reviled former Champ's unforeseen triumph. No fight with Joe Frazier could ever compete with that. Unbeknownst at the time, the real battle between Ali and Frazier was the circling they did of each other in '72. A fight with boundless rounds that was more about anticipation than climax. More about endurance than punishment. Happy Birthday Champ! Only the strong and the wise truly endure - you are both.